Would you please slow down? I cannot keep up with today! It is release day for Fairway To Heaven – Mark 2 – out today with Escape Publishing. If you’re a regular visitor here you’ll know Fairway was first launched in 2014, but due to subsequent decisions about self-publishing not being the best fit for me, Escape accepted Fairway for publication late last year. So – Fairway To Heaven – with a new cover, new blurb and a slightly newish ending, is out again today. It’s like having deja-vu all over again. a blog post about what makes a house a home with blockbuster rural romance author Je nnie Jones at her place (so much classier than my place). This great image by the incomparable Rhyll Biest, which won’t mean much unless you either wrote Fairway To Heaven (like me) or you’ve read it. An amazing amount of support from fellow Aussie authors and bloggers, and Facebook and Twitter friends. I appreciate your support so very much. When I got home from work, my FB notifications were at 62. 60-bloody-2, and don’t mention Twitter! Later today, I’m a guest at http://www.readingromance.com/ talking about how I come up with book titles. So, in the words of Bill Lawry (sorry, couldn’t help a cricket reference) It’s ALL HAPPENING! 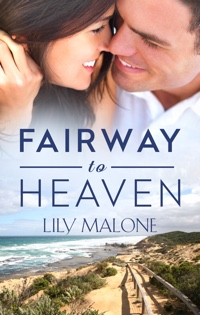 And if you’re interested in taking a look at Fairway To Heaven, please visit this link. Whatever your e-reading option, you’ll find a buy-link from here.